This charming home in the Wellington’s Edge neighborhood overlooks a natural preserve with a beautiful walking path to the community pool. The home features sprawling neutral tile on a diagonal throughout the three-bedroom, two-bath residence. Although the homeowners opted for a neutral backdrop, you will see amazing pops of color throughout this impeccably maintained home — touches the homeowner placed strategically in each room, allowing each to take on a life of its own. Living Room: The spacious open floor plan welcomes visitors through the doors into this formal living room area. Kitchen: The home’s kitchen is white on white with upgraded cabinetry, adorned by crown molding. A convenient breakfast bar overlooks the family room. Family Room: The great family room sits right beside the kitchen, making entertaining fun and engaging, and allowing for guests and the host to stay connected. Family Room View: The family room overlooks a screened-in lanai, allowing for scenic nature views throughout. Dining Room: The formal dining area is part of the open floor plan, but also features two walls to give the space some degree of separation. An elegant traditional dining room set allows the homeowners to enjoy lovely sit-down meals for two or more people. Master Bedroom: The master bedroom overlooks the natural preserve. It features his-and-her closets with one large walk-in and storage, as well as access to the beautiful master bath. High ceilings allow for the wood, four-dome ceiling fan to be hung with ease. Master Bathroom: The master bathroom is impeccably decorated and features a walk-in glass shower and built-in laundry closet. Plenty of daylight allows for the perfect lighting when getting ready. Guest Bedrooms: Not pictured, this home features two secondary bedrooms, both with spacious closets. Each can be utilized as bedrooms, or perhaps an office or hobby room. Front Elevation: The well-maintained property makes the curb appeal on this already gorgeous home entry that much more spectacular. With a large column entryway, as well as an etched-glass doorway, everything about the home is inviting. Front Elevation: This European-inspired home sits on more than four acres in Saddle Trail park. Well-manicured, mature landscaping greets visitors as they arrive via the circular stone drive. Main Room: Fresh, contemporary neutrals and plenty of amenities make this open-plan living space one of the most comfortable rooms in the home. There is easy access to both an office and a formal dining room with seating for 10, as well as access to the home’s elevator. 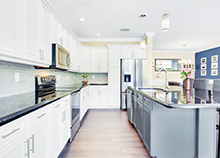 Kitchen: The eat-in kitchen features top-line amenities, such as a Wolf six-burner range, Subzero refrigerator, dual-temperature wine fridge and built-in coffee center. There’s a large island allowing plenty of prep room. Wood plank flooring grounds the space. Master Bedroom: The master bedroom features his-and-her walk-in closets and a marble en suite bath with a dual-head shower, free-standing tub and two Toto smart toilets. There are French doors to the pool and a wood-burning fireplace. Outdoor Kitchen: Chicago brick patio and walkways extend throughout the grounds. A separate gazebo houses an outdoor kitchen complete with its own brick flooring and plenty of room for guests — not to mention great views of the arenas. Barn: This crisp, white 16-stall barn features top equestrian amenities. Check out the candle-style iron lanterns, vaulted ceilings and sliding metal stall doors. There is also a grass Grand Prix ring, lunging ring and all-weather arena, together with seven paddocks, a four-horse Kraft walker, covered aqua spa and treadmill areas. Outdoor Seating: With its view of the grounds and detached summer kitchen gazebo, this outdoor seating area between the house and the ring features a cozy fire pit. Playground Area: This view at dusk of the home’s playground area near the in-house gym shows what good landscape lighting can do for a home. Because of it, the tree featured in the center of the drive takes on a beautiful importance. 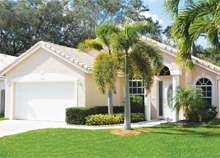 For security, the property features automatic gates, and there is a smart home security system and generator. Horse Statues: Aside from this lovely equestrian artwork, the secure, fenced property spans more than four acres, allowing both homeowners and horses plenty of room to stretch. There is also a private office, tack room, feed room, laundry room and a three-bedroom groom’s apartment. Pool Deck: Two guest rooms upstairs open onto a private balcony overlooking a Chicago brick-paved pool deck, heated salt-chlorination pool with attending spa and, of course, the expansive views. There are French doors in all the primary living spaces, allowing homeowners and guests to take full advantage of South Florida living at its best. This recently upgraded Olympia abode has both practicality and a wow factor. 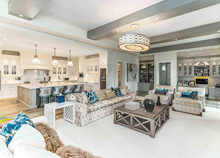 The Capistrano model home features a bedroom and full bathroom downstairs, in addition to a spacious master suite and three more bedrooms upstairs. In keeping with today’s trends, there are four bathrooms as well. There is also an attached two-car garage, and a pool area featuring the latest in salt system pools. Privacy hedges in the backyard imbue the property with a comfortable family feel, even as they provide a level of safety and security. Front Elevation: The home’s front elevation features great curb appeal with upgraded landscaping and crisp, clean lines. Great Room: Crown molding, designer window treatments, recessed lighting and contemporary colors all set this home apart. Even underfoot, no expense was spared. The open plan living area downstairs features extra-long planks of wood-look tile. Staircase: Descending from the second floor, one can take in most of the downstairs common area and even part of the yard. The expansive great room allows for a variety of seating configurations, and the breakfast bar offers yet another place to gather. Dining Room: The dining room can handle a crowd or be easily adapted to a more intimate setting. The well-lit room features a statement wall perfect for displaying beloved photographs. Guest Bedroom: Three tastefully decorated guest bedrooms upstairs bring the total number of bedrooms to five in this spacious family home, which also features four bathrooms. Kitchen: The light, bright and modern kitchen has a crisp, clean vibe thanks to its extended white cabinetry, granite counter tops and stainless-steel appliances. A sink in the island makes clean-up a breeze. Master Bedroom: A vaulted tray ceiling in the master bedroom gives a dash of importance to the chandelier, while an ample bank of windows lets in plenty of light. There are two separate closets complete with organizers. The en suite bath features a soaking tub with a separate shower. Lanai: A covered lanai adds more living space to the home, especially in the winter months. Two sets of sliding glass doors make for a seamless transition from inside to out, and fabulous stone decking adds pizzazz. Pool: A large salt system pool by Sunsational Pools beckons from the backyard, protected by the comforting privacy hedge. 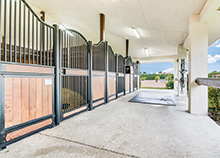 This world-class, 60-stable, 14-paddock equestrian facility is located on one of the largest parcels of land in Grand Prix Farms, just a short hack from the Winter Equestrian Festival show grounds. The property was remodeled last year to include abundant amenities — a hot walker, a treadmill, a lunging area, a hunter arena and an oversized jumping arena with the finest footing available. The staff quarters feature five apartments for grooms and trainers, with 13 bedrooms and six baths between them. This includes an owner’s apartment, a manager’s apartment, a rider’s apartment and two grooms’ apartments. Jumping Arena: There are two extra-large arenas, one of which is sand and the other features a privacy hedge. The U-shaped barn has been expanded to both the left and the right, taking best advantage of all nine acres of the property. Manager’s Apartment: The manager’s apartment, located over the stalls, features two bedrooms and a balcony. Storage Lockers: The oak-paneled cabinets to the left offer plenty of storage, while rubber mats are easy on horses’ hoofs. Tack Room Area: Equipment trunks are located in front of the tack room, offering easy access to those on the go. Walkway: Gracing the barn ceiling are light fixtures that would make any homeowner proud. The door to a groom’s apartment is to the left of the console. Courtyard View: The courtyard view from the manager’s upstairs apartment is quite striking. Pathways: This image, taken from the balcony, shows how the manager can survey almost the entire property from his or her apartment. Equipment Lockers: Equipment lockers are strategically placed throughout the expansive barn area. Breezeway: The stables have been situated with the ability to capture a breeze. Cooler temperatures are coming, and that means spending more time outdoors in the backyard, relaxing on the pool deck or entertaining on the patio. This recently revamped Mediterranean style two-story home in the Golf Brook neighborhood of Palm Beach Polo features a show-stopping pool area, and also boasts five bedrooms with en suite baths for a total of six-and-a-half baths. 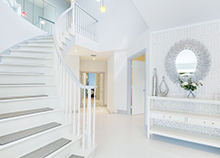 This amazing home also features a custom staircase and railing, marble and wide-plank wood flooring throughout, no-drapery window treatments, hurricane impact glass, an alarm system, security cameras, a whole house generator, a two-car garage with wood doors and wood-burning fireplaces both inside and out. Pool Deck: A sparkling saltwater pool and spa, expansive covered lanai with retractable screening and a separate outdoor kitchen stand at the ready to host spectacular backyard gatherings. Color-filled planters and lush tropical landscaping imbue a sense of privacy, while the view from the upstairs balcony offers another way to enjoy the space. Living Room: The open plan of the home allows both residents and guests to move freely throughout the foyer and gallery to the step-down formal living room. The fireplace adds an element of coziness. Seating Area: The living room is open enough to accommodate several seating areas and opens onto the generous back lanai with its tongue-and-groove pecky cypress ceiling. Dining Room: A vaulted ceiling, marble floors and French doors that open to still more outdoor seating give this formal dining room a classic feel. Kitchen: Custom wood cabinetry with plenty of pull-outs, granite countertops, Wolf and Sub-Zero stainless-steel appliances, double convection ovens, an apron sink and an induction cooktop make this kitchen particularly chef-friendly. Bedroom: Step out of bed and greet the morning with a smile on your face when you venture out onto this northeast-facing balcony. Master Bath: This wood-look, tile-floored “his” bathroom connects to “hers” through a roomy shower, then it’s on to the master bedroom’s custom closet. Bedroom: This downstairs en suite guest bedroom features a bumped-out seating area and lots of natural light. Soaking Tub: The “hers” bath features a Roman soaking tub and built-in TV. Front Elevation: The arched double doors of the front entry are framed by bougainvillea, making this home beautiful by day and, thanks to well-placed landscape lighting, somewhat mysterious by night. This custom-built waterfront home, located on a quarter acre in the Sugar Pond Manor neighborhood, features an exquisitely maintained yard and extra-long views of the lake. The home has four bedrooms in a split bedroom style, two baths, a family room, a great room and a laundry room. Vaulted ceilings with skylights let in plenty of light, while hurricane panels, exterior lighting and motion sensors add a level of protection. Situated on a large lot, the home is just minutes from Wellington’s equestrian venues. Game Room: A billiards table currently takes center stage in the open floor plan. Sliding doors dominate one entire wall and frame the ever-changing panoramic view of the outside. The large room feels even bigger due to the high ceilings. Guest Bedroom: This guest bedroom is one of three. With plenty of natural light, it can easily be converted to an office, exercise room, meditation space or craft room. Kitchen: Hardwood cabinetry in shades of honey keeps things light in the home’s spacious chef’s kitchen, while striking black appliances ground the space. A stunning tile backsplash adds an element of fun, and a large granite island anchors the space. Dining Room: An arched window mirrors the entrance to the formal dining room, while stately support pillars add interest — just a few of the details that give this home its distinct personality. Family Room: Vaulted ceilings and an expansive built-in entertainment center define the family room, which offers convenient access to the pool and patio, as well as to the kitchen. Ceramic tile in a dynamic offset pattern allows for easy, breezy indoor-outdoor living. Front Elevation: The home’s oversized two-car garage includes plenty of space. Driveway pavers installed just recently complement the well-manicured lawn. Pool: Terra cotta brick pavers surround the heated freshwater pool while, a few steps up, a hidden spa beckons. There’s also an outdoor shower and summer kitchen within the screened enclosure. Cabana Bath: This cabana bath functions as a pool changing room while also serving as the guest bath. Master Bedroom: The roomy master suite features easy access to the pool and a large walk-in closet. Master Bath: A tray ceiling over the pedestal Roman soaking tub adds drama to this en suite bath, while double sinks and mirrors add practicality. A contemporary two-door walk-through shower completes the space. Located in the Wellington’s Edge neighborhood, this two-story, single-family home is located in the heart of it all: close to shopping, medical facilities and top-rated schools. Adjacent to a nature preserve, the home affords a quiet retreat from all the hustle and bustle. It features an open concept layout, a split bedroom plan and a completely fenced backyard with lush landscaping. Meanwhile, accordion shutters provide extra protection from the elements. A paved patio off the kitchen makes for great entertaining. Outside, a network of walkable concrete sidewalks provide a sense of connectivity with the rest of the neighborhood. 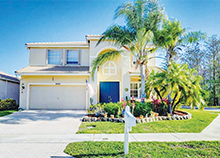 The family-friendly community features bicycle paths, a clubhouse and a neighborhood park. Living Room: The living room features lovely white plantation shutters and a statement wall featuring a large collection of artwork and curios. A door to the backyard patio is featured in the corner, and oversized ceramic floor tiles throughout the main living space make indoor/outdoor living a breeze. Crown molding adds a touch of class. Main Living Area: The open floor plan brings the living room and dining areas together with plenty of seating and a wonderful place for family gatherings. Dining Room: The dining room can be set up for more formal occasions. There’s plenty of room, and the adjacent kitchen makes serving and clean-up a breeze. Guest Bedroom: One of three spacious, fully carpeted guest bedrooms, the room offers plenty of natural light and is tastefully decorated. Home Office: This restful space currently houses a private office, but it also serves as one of the three available guest bedrooms. Master Suite: The master suite features a tray ceiling, walk-in closet, bonus sitting room and an en suite bath, complete with dual sinks and rainfall shower head. Front Elevation: The two-story home boasts a two-car garage, covered entry and distinctive barrel tile roofing. Kitchen: Recently upgraded with black granite countertops, the light and spacious kitchen offers a wonderful view of the backyard. Breakfast Nook: A cozy breakfast nook serves as a convenient dining area just steps from the backyard outdoor space. Guest Bath: Black granite countertops are also featured in the guest bath. The home features two full baths and one half bath. Located in the heart of Wellington’s equestrian community, this Paddock Park Phase II home was built with recreation in mind. Located on a waterfront, horse-friendly lot of nearly three acres, the main home has five bedrooms, three-and-a-half baths, a summer kitchen, heated pool, basketball court, cabana bath and an outdoor shower. There is also a two-bedroom, two-bath guest house on the property. A state-of-the-art private gym is located in one-third of the three-car garage, and there is a separate entry to a nanny suite. As versatile as the 4,600-square-foot house is, the large lot has room for expansion, with plans available for an eight-stall barn. Living Room: Gleaming, oversized tiles and plenty of skylights throughout the home add a museum-like spaciousness to an already open floor plan. Plenty of glass doors offer easy access to the outdoor entertainment area with its built-in grill, a key feature of the property. The space is centered around an impressive wood-burning fireplace. Family Room: The expansive feel of the main floor continues through the living room, family room and den. A loft area overlooks it all, and a central vacuum system makes clean-up easy. Dining Room: Arched windows and double doors lead to this quiet, semi-private formal dining room. There is also a family dining room, breakfast area and snack bar. Bar Area: A wet bar is conveniently located between the kitchen and one of two family rooms. The kitchen itself offers top-of-the-line Jenn-Air appliances, quartz countertops, an island and more. Master Bedroom: Complete with elegant volume ceilings, the spacious master bedroom suite opens directly onto the pool deck featuring a screened and heated pool. a three-car garage stands ready to serve its owners. A concrete barrel tile roof adds pizzazz, as well as an extra layer of security. Patio Area: The breezy, open-air patio is great for entertaining, with its ping-pong table and easy access to the pool. Master Bedroom: The master bedroom features remote-control shades and is spacious enough to offer a sitting area, separate his and hers closets and an en suite bath. Master Closet: Keeping clothes and accessories organized is a snap with all the built-in shelving in this bright, sunlit closet/dressing room. Master Bath: The pristine white master bath suite features a walk-in rainforest shower, dual sinks and a whirlpool spa. This home in Wellington’s exclusive Equestrian Club community has a lake view, a three-car garage and a gorgeous lap pool and spa. Built as one of the neighborhood’s sought-after Stockton styles, it has a unique upgrade that expands the living space. One of its five bedrooms has been opened up to become an integral part of the main living area. A game room/bar now joins the living room, kitchen and dining area to make entertaining just that much better. The home features four-and-a-half baths and a luxurious master suite boasting high ceilings, crowning molding, electric curtains, custom closet organizers and an amazing master bath. Living Room: A decorative inset feature tops cathedral ceilings, while arched windows and an arched statement wall make the formal living room anything but boring. Light floods the room, shining off the ceramic tile, which runs throughout the common spaces. Family Room: A breakfast nook, kitchen bar and family room all coexist just off the kitchen. But don’t linger long — the backyard beckons through plentiful windows. This room has a view of the pool and spa, but there is also 75 feet of lakefront with a view all its own. Kitchen: With its hardwood cabinets, granite countertops and backsplash, convenient island, handy pantry and plenty of workspace, this kitchen is every chef’s dream. The stainless-steel refrigerator, wall oven, gas range, microwave and double sink tie everything together with a distinctly contemporary vibe. Dining Room: This pleasant formal dining room serves as a convenient gathering space with a bright, airy feel. An arched inset wall provides space to proudly display collectibles, while the stately hall leads to the guest bedrooms and baths. Game Room/Bar: This re-imagined bedroom off the main living space now features a bar and built-in shelving for collectibles. Adding to the home’s living area, it is the perfect retreat, while also serving as a convenient additional entertaining area. Master Bath: The master bath features an elevated tub, dual sinks, walk-in shower, recessed lighting and glass block tile throughout. A short hallway leads to the walk-in closet. Patio: Pendant fans and a nearby half bath make this patio an extended living space. Rain or shine, it’s a great place to gather. Pool Deck: This 15-foot-by-30-foot lap pool includes a separate spa area. The pool deck also features amazing views of the 75-foot lakefront. Entry Fountain: The leaping horses of the entryway’s multi-tiered fountain is a daily reminder of Equestrian Club living. Front Elevation: The Spanish tile roof, tall portico and porthole windows have everything looking shipshape at this private Equestrian Club retreat.